Weirdly-located label for battery "Brightness"
Possibly this is related to lp:1227250 , which I see is freshly fixed; I'm on build 99 (20131015.2), and I've seen this in earlier builds although I haven't been able to reproduce it (and am not confident of these conditions now :( ). With these caveats, I'll attach a screenshot. The label for the brightness indicator appears (unreliably) inside the slider--is this intentional? Will verify in released image tomw. This is more likely to be a bug in unity8. No, it's not intentional. Please make Confirmed if you can find a way to and reproduce. This is both unity8 and indicator-power issue. 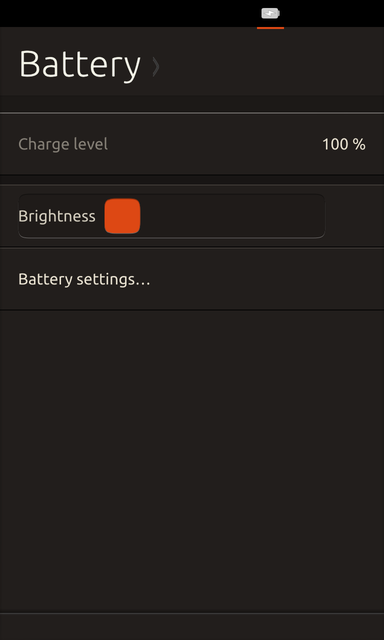 indicator-power shouldn't be setting a "Brightness" label for the items it doesn't want to have a label. There is also a bug in unity8 slider item which isn't giving the correct width for the sliders which have a label. * Place ShaderEffectSource of UbuntuShapeForItem under the Shape Item. * test: make sure the search indicator hides when an app has focus. * Fixed indicator slider menu item alignment to label field and icon. * Update to autopilot 1.4.
really don't need to keep bus proxies alive for each device. returned by g_icon_serialize() as floating.